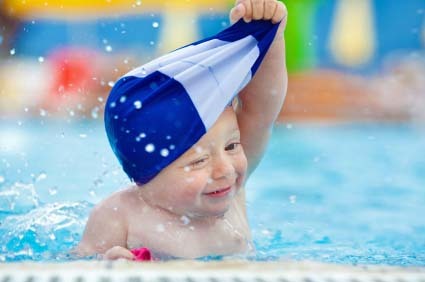 The best choice and assortment of swimming caps can be found here. Swimming is fun, but unless you have a bald head, you've probably noticed that hair tends to get in the way. This is one way in which we are different from ocean life - life that is clearly intended to be in the water. Fish, sharks, whales, and every other life form in the ocean are relatively bald; they have no hair to keep away from their eyes, and they are much more efficient as a result. That being said, if you want to swim competitively, or even swim at all, using a swimming cap may be to your advantage. Not only will a swimming cap keep your hair out of your eyes – which is a very important issue for a natural swimmer, but it will also serve to cut down on resistance, which is undoubtedly the result you were really going for. Swimming caps were used long before swimming became a competitive sport, and they were worn by both men and women. In the beginning they were made of a rubberized fabric, and in the twenties they became latex head coverings. There were some changes during World War II simply because of the rubber shortage. As you know, rubber is a petroleum product, and it was needed overseas. Rationing made it nearly impossible to obtain rubber products of any type, and as a result, swim caps became a coveted object. Swim caps today have a number of different styles from competitive racing styles to casual styles. The more competitive styles do not have a chin strap or an inner sealing to keep water out. Today's swim camps can also be composed of polyester, fabric, latex, or even silicone. The journey to the modern swim cap has been a long one, so let's take a look at the time table to provide you with a better idea. Before 1883: Swim caps were not rubber or latex during this time period, but rather simple hair nets that one could use to keep their hair up during both swimming and bathing. 1883-1920: Rubber swim caps were introduced in 1883, and soon enough competitive swimming would come about. It was also this era that introduced the swim cap as a fashion item. Roughly eight years after 1920 the great depression would strike America, and the swim cap would once again become scarce. 1968: Fashion changed significantly during 1968, and while some blame the hippie movement, others attribute it to the fact that fashion simply has to change at some point. Many people saw it as an older piece of clothing from the previous generation while swimmers still saw it as an important piece of equipment in their competitive arsenal. Today: Swim caps still have not retaken their fashion throne, but they are still here, and they are made from a number of different materials which could include latex or neoprene. The best choice and assortment of swim caps can be found here. The history of swim caps is definitely an interesting one, and it will be just as interesting to see where they go. What are your "can't do without" swimming gear? Why? Share your favorite and most effective swim bag contents!